Ghostface Killah Australia & New Zealand Tour | SOUL OF SYDNEY FEEL-GOOD FUNK SOUL DISCO vibes & beyond. 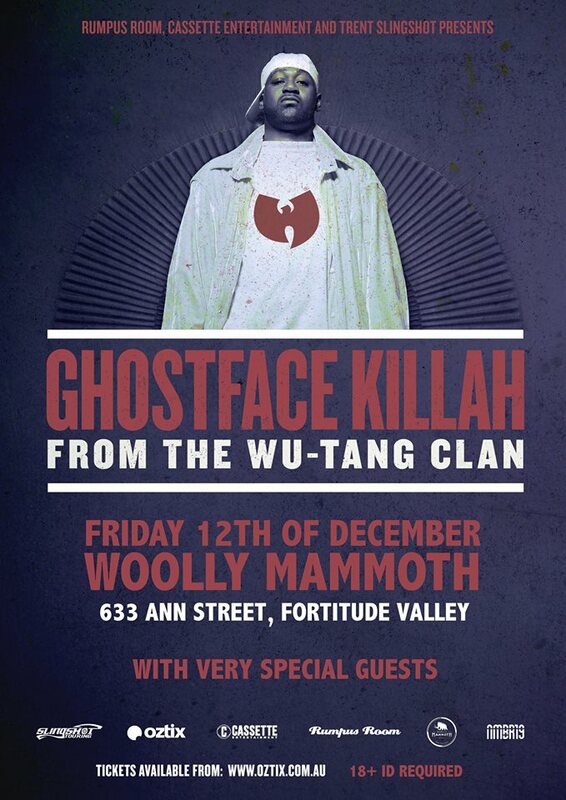 The return to Australasia of one of the most iconic hip-hop artists of our time, Ghostface Killah from The Wu Tang Clan will blaze up Australia and New Zealand this summer! Dennis Coles (born May 9, 1970), better known by his stage name Ghostface Killah, is an American rapper and prominent member of the Wu-Tang Clan. After the group achieved breakthrough success in the aftermath of Enter the Wu-Tang (36 Chambers), the members went on to pursue solo careers to varying levels of success. Ghostface Killah debuted his solo-career with Ironman in 1996, which was well received by music critics. He has continued his success over the following years with a host of critically acclaimed albums. His stage name was taken from one of the characters in the 1979 kung fu film Mystery of Chessboxing. He is the founder of his own label Starks Enterprises. ← TOUR NEWS: Fat Freddy’s Drop + Nighmares on Wax heading to Aus – Jan 2015.